Regardless of your profession, crafting on Cataclysm UO may be a bit different than you've seen on modern shards. 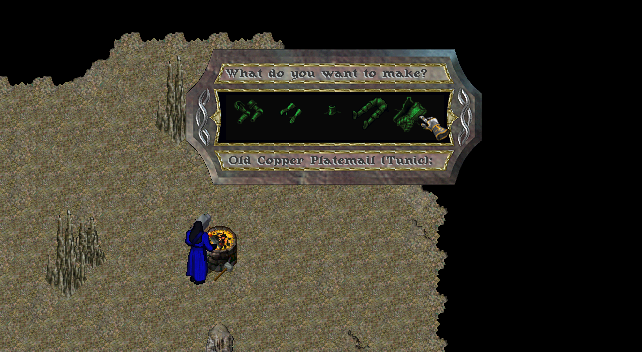 With all original T2A menus, gumps, and animations intact, crafting will bring hours of entertainment and nostalgia to your adventure. Grand-Mastering many of these skills will lead rewards not only fun and valuable, but may be useful to you while crafting. Blacksmithing is an integral and rewarding crafting skill on Cataclysm UO. The play style revolves around having good armors to increase your defense, and strong weapons to aid you in your battles. With 26 unique armors to create, and 24 powerful custom weapons to craft, you will never be bored while working over the forge. Our custom weapons require special recipes and ingredients to create, some of which are the strongest weapons in the game! We welcome all chemists to test their skills on Cataclysm UO's unique retro alchemy system. Mimicking the potions available on many Sphere 51a servers, Alchemy is important for PvP, PvM, and Animal Taming. 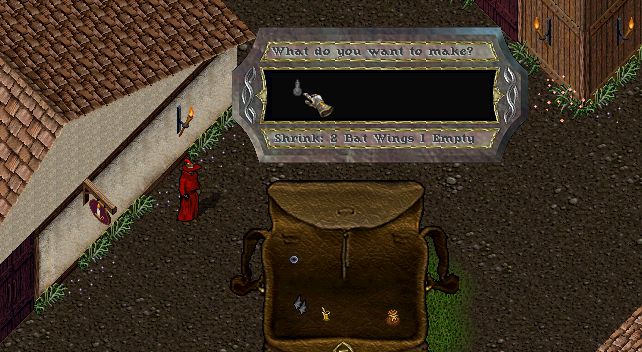 Shrink potions will make any pet bite-sized so you can store it in your bank, and you do have the option to place your pet in the stables like the modern shards. Invisibility potions may help you escape from dangerous foes or keep oneself incognito to the surrounding environment. Mana and Total Mana potions are very useful to our combat style, and help promote ferocious sword wielding spell casting battles. 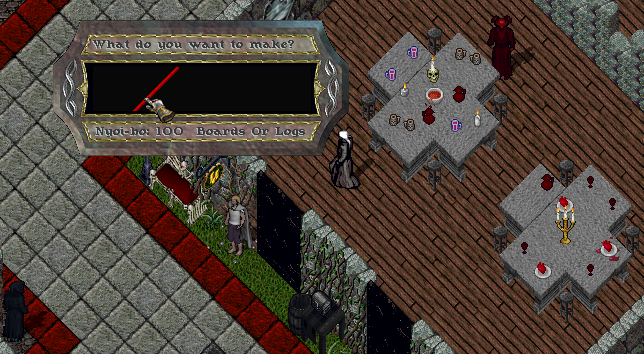 You may also craft kegs to store large quantities of potions, and may be rewarded for Grand-Mastering this useful skill. Just like the old days, tailoring is a profitable and rewarding profession on our shard. Fans of Sphere 51a will notice instantly the old menus and functionality of this skill. You will always know what cloth you are working with, as the correct color will be displayed in all crafting gumps. As a Grand-Master, you will show off your garb with your own unique, special dye tub, with the color of your choice to stand out from the rest of the pack. Your special dye tub will be rewarded automatically with an interactive gump displaying your choice! You may pick your color by hue number. Keep in mind, there are some color restrictions, and you may only have one Tailoring tub per account. Bowcrafting and Fletching will give your characters the best long-range weapons in the game. Special recipes will unlock powerful bows that will help promote dynamic long range combat, both against players and monsters. 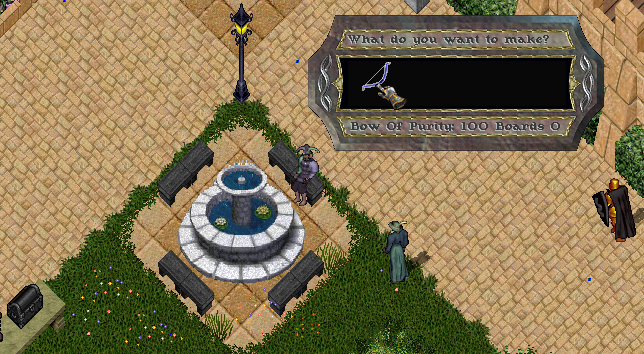 Fletching functions the way it did in The Second Age era of Ultima Online, with a custom weapons feature built into it. Carpentry is not only the skill required to build your typical chairs or tables, you will be able to create wooden staffs that are powerful weapons. With the aid of special ingredients, and perhaps a support crafting skill, you can create ultimate staff weapons only the best carpenters produce. 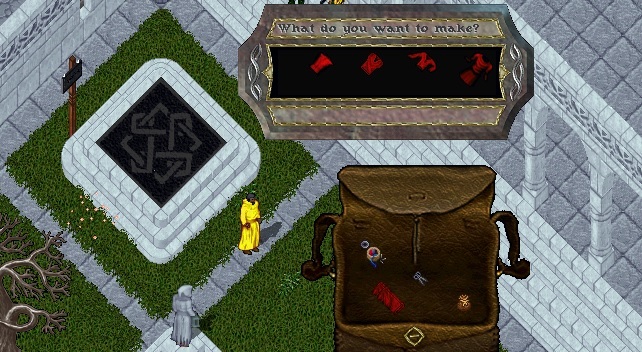 Complete this skill and you will receive a Carpentry tub any color of your choice. Keep in mind, you may only have one Carpentry tub per account.